Mickey Lolich, now 77, pitched for 16 years in the major leagues, the first 13 with the Detroit Tigers. When he retired with the San Diego Padres in 1979, he had the most strikeouts of any left-hander in any league. 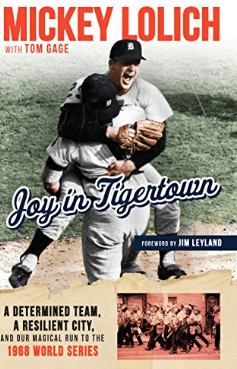 Lolich has now written a book with former Detroit News Tigers beat writer Tom Gage, “Joy in Tigertown: A Determined Team, a Resilient City, and our Magical Run to the 1968 World Series.” In it, he talks about how Mike Ilitch in 1968, before owning the team, hired him to sign autographs at stores to promote Little Caesars. He said Ilitch, having played in the Tigers’ farm system, was a big fan of baseball and Detroit. Mike was as excited as anyone about our success. That’s because he had been a player in the Tigers’ organization. He knew his baseball. He definitely did and he was a Detroiter through and through. So, of course, he was thrilled when we won. The whole city was. But he also knew — as did his wife Marian — that it would be good for business to be closely associated with a winning team and to have a Tigers player as a company spokesman. So about a month before the World Series, Little Caesars contacted me about signing autographs at stores that would soon open in nearby Flint and Utica, Michigan. I agreed to sign, but the season was still going on, so we let it go until later. There was a lot of baseball still to play before I could make those appearances. Things were going well, but suddenly Ilitch no longer needed him. Everything went well between us initially, but at the end of the second year right around the Christmas holidays, I got a letter saying my services were no longer needed at Little Caesars. “What the hell did I do wrong?” I wanted to know.